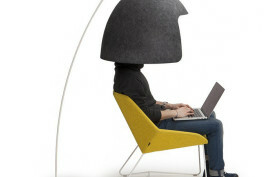 Staying focused at work can be challenging for a variety of different reasons, from the coworker who screams on personal calls to the colleague who chews gum with his mouth open, but this clever piece of office furniture is here to help you keep your head in the game (literally and figuratively). Tomoko, designed by MottoWasabi, is an acoustic dome that promotes privacy and concentration in open-plan offices, lobbies, and other public spaces, so you can physically create your own office no matter what your surroundings are. Do you love living in the city but find the roaring traffic, cars horns, ambulance sirens, drilling, and barking dogs impossible to deal with? Stop suffering from all that stress–block the noise and restore your sanity with a Cork Helmet. 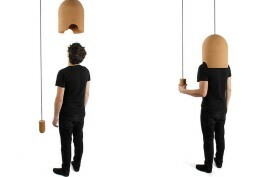 As silly as it might look, Brussels-based Pierre-Emmanuel Vandeputte‘s design will help you deal with NYC’s excessive 70-decibel sound level while you use your precious quiet time to daydream about calmer pastures.